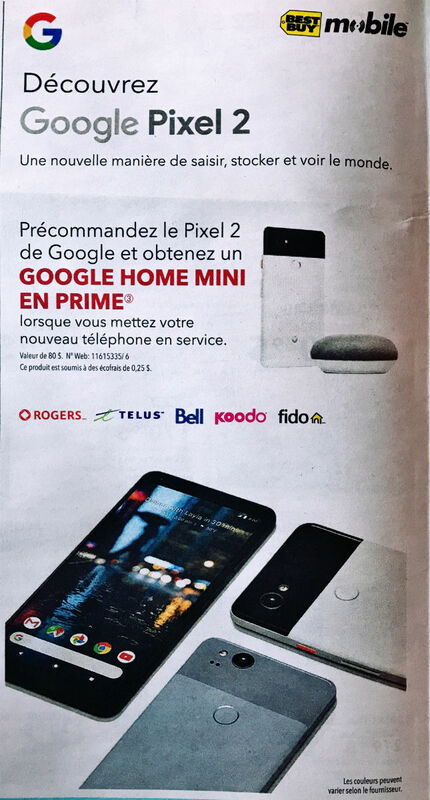 According to next week’s Best Buy newspaper insert/flyer, if you pre-order a new Google Pixel 2 or Pixel 2 XL, they’ll hand you a Google Home Mini for free. At least that’s what the translation from French to English is telling us in an image posted over at reddit. The picture of the flyer below shows both the Pixel 2 and Pixel 2 XL, along with the Google Home Mini, so we’re assuming the deal is for either phone. It does specify the Pixel 2, though. While that’s Canada’s Best Buy running a deal, I wouldn’t be surprised to see both Google and Best Buy do something similar here. With the Google Home Mini being introduced alongside the new phones and priced at just $49, it’s the perfect kind of add-on bonus. Google sweetens the deal for its new phone by getting its cheaper speaker with Google Assistant in your home as you pick-up a Pixel 2 or 2 XL. On a related note, Google handed out free Daydream View units last year. While I’m always cool with freebies, a Google Home Mini is 100x a better bonus than a VR headset, in my opinion. That help push you towards buying one of the new Pixel 2 phones?